The logo for the game, along with the poster art that accompanies it on the title screen of the game. The poster art was one of the few images already drawn by the Previous Illustrator, but 16 Swans requested me to draw it again to fit in with the colour and charm of the rest of the illustrations I made for the game. In terms of composition, it is roughly the same to how it looked before, with the biggest difference being the Butler Zombie’s appearance. I wanted to make this image seem “poster-worthy” though, so I made it look a lot more dramatic and dynamic. And 16 Swans and myself believed I accomplished this successfully. The zombies in the background are just placeholders and do not actually appear in the game. As for the logo, this was the tricky part. Given the title was quite a mouthful, it would be quite challenging to structure all of the long words together to make it cohesive and well-composited. I was very clear from the start however that I wanted the words “Iggy” and “Pug” to stand out from the rest of the title. I drew several different designs, one of which satired B-Movie films, but in the end, we went with something simple and bold. Iggy being the main title of the game would allude to future games involving Iggy (upon which even I have not been informed of yet), and thus, I wanted to make that word’s typography look iconic and easy to copy and paste for any future subtitles, if any. The green and pink colour scheme was the main colour scheme we had in mind for the rest of the game’s interface, but that was later changed, but the pink and green of this title still remained. 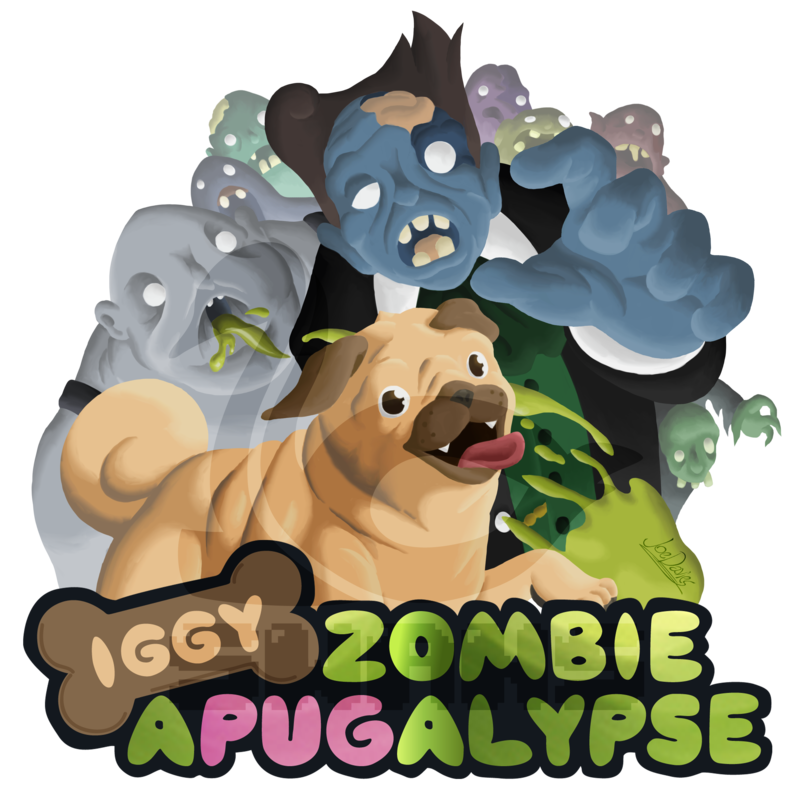 Fun Fact: I was the one who came up with the “Zombie Apugalypse” subtitle. It literally just came to me in my head when I was eating dinner, and I was like “I have to tell my family this!”, because i was eating with my family at the time. I also designed the logo for 16 Swans’ company. But for security reasons, I’m not going to show it here. You can easily find the logo in the game itself, the trailer, or the company website.